Video – Traxxas Unlimited Desert Racer Snow Session « Big Squid RC – RC Car and Truck News, Reviews, Videos, and More! It is the time of year when rc hobbyists sometimes get the chance to enjoy snow driving. Both our Chicago and St. Louis offices have snow on the ground as we speak, and if you’ve ever driven in the stuff, then you already know how fun it can be. 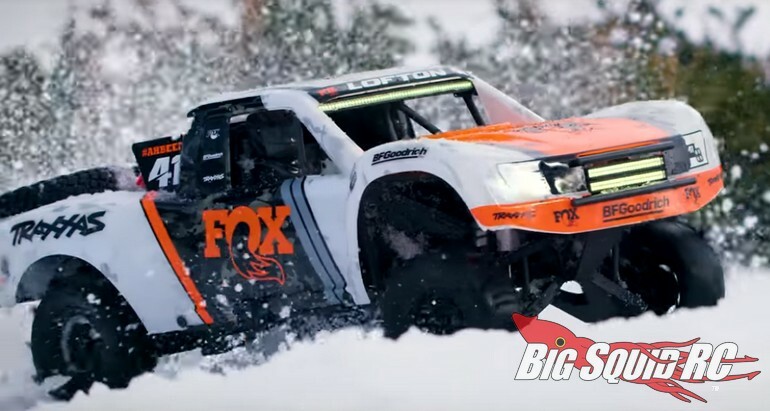 The folks at Traxxas are big fans of having fun in snow too so they’ve posted a new Unlimited Desert Racer Snow Session video. The video captures the UDR at its very essence- snow drifting around corners and catching airtime. The UDR’s scale looks and driving style are perfect for enjoying the snowy winter months. Feel free to hit up this link for full Traxxas Unlimited Desert Racer Details, or Click Right Here to read more Traxxas news on BigSquidRC.